This instrument is very similar to Epact 91295. This example does not have a latitude scale though one of the plates is made to revolve and there are no notches to facilitate the turning. The plate with the declination scale and hour lines has been cut from and engraved on the back of an old engraved printing plate, and part of an illustration and some text are still visible on the other side. 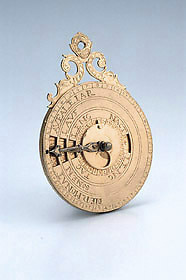 The dial was regilded at the end of the 19th century.